To develop health promotion messages and campaigns that resonate with AI/AN communities, our team uses social marketing, an evidence-based planning process that improves the impact of health promotion messages. The model uses formative research to identify priority populations, segment the community into distinct audiences, pretest messages, materials and strategies with the audience, and then monitors the campaign to assess its effectiveness. Please feel free to download, print, or pass on any of our campaign materials. Or use the campaign logos on your own shirts and promotional materials. Participants will begin working on tools and templates to design a social marketing campaign addressing underage drinking and/or Rx drug abuse, aligned to their community’s readiness level. 1:00 p.m. – 1:30 p.m. Tigers and Bears! Tailoring your campaign. Collecting local data and feedback. Selecting media products and dissemination strategies. The LGBTQ – Two Spirit, Loved & Accepted. 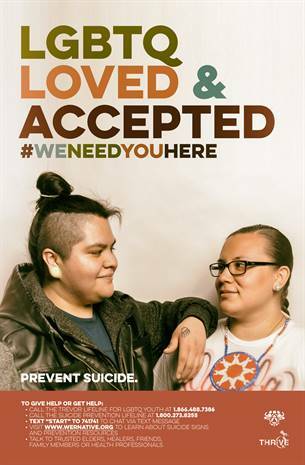 #WeNeedYouHere campaign encourages people to learn about the different gender and identities historically found in their Tribe(s). This campaign shows love, acceptance, and support for anyone identifying as Lesbian, Gay, Bisexual, Transgender, Queer, and/or Two Spirit. Please download, print, and pass on these amazing materials. Check back around June 25 for four Lived Experience interviews with Native young adults who identify as LGBTQ or Two Spirit. The Stand Up, Stand Strong campaign launched in 2012. It empowers youth to stand up against bullying. **The web banners can be used on your own webpage. You can hyperlink it to the THRIVE webpage or to another bullying prevention webpage such as: www.stopbullying.gov. The I Strengthen My Nation campaign launched in 2012. It empowers Native youth to resist drugs and alcohol and encourages parents to talk openly with their children. We encourage you to print out the logo, have youth add their own words or pictures describing how they “Strengthen their Nation,” and then post it to social media using #WeRNative. 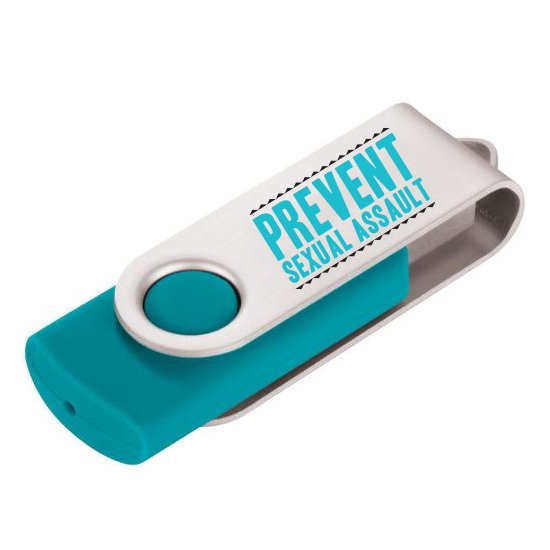 The My Body, Mind, and Spirit are Sacred campaign was designed to address and prevent sexual assault. The What is Done to One is Felt by All campaign was designed to prevention family maltreatment, including child abuse, elder abuse, and intimate partner violence. The Native. Tested. Proud. campaign encourages routine HIV testing for everyone 13-64 years old. Funds for the project were provided by the Substance Abuse and Mental Health Services Administration’s (SAMHSA) Minority AIDS Initiative (MAI) and the Indian Health Service. The Native. LGBT. Proud. 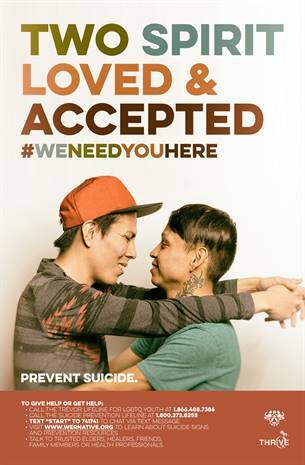 campaign was designed to reduce stigma and promote HIV testing among AI/AN LGBTQ Two Spirit community members. Funds for the project were provided by the Minority AIDS Initiative (MAI) and the Indian Health Service. As a part of the Generation Indigenous (Gen-I) initiative, NPAIHB trains AI/AN youth from across the U.S. in leadership skills, social marketing, and health activism. The workshops are 2 full days to engage and educate participants about youth-driven social marketing campaigns designed to prevent youth suicide and substance abuse and promote cultural identity and resilience. Here is some of the work created for Native youth, by Native youth.